The first of the herd is the industry’s identity crisis. The elephant-sized question is: Are we going to be a trade or are we going to be a profession? Historically, EMS has operated as a high-level trade that only required a high school diploma and a driver’s license. Although progress has been made with educational minimums that may evolve to degree requirements, there is resistance from EMS leaders who don’t want the heightened requirements to hinder recruitment efforts. Takeaway: EMS can learn from nursing. Nurses developed a stronger educational base nearly 30 years ago with positive outcomes including upward mobility, improved salaries and professional respect. EMS needs a stronger educational base if it’s going to expand into community paramedicine and other services. It’s necessary if we want to grow into a more stable and meaningful contributor to the community and the healthcare continuum. Though the benefits of improved educational systems are not well understood by colleagues, governing boards, funders or the public, we need to start to work on this now. If we don’t, we’ll still be sitting here 30 years later and we won’t have made a difference. For decades, there’s been a sacred understanding that a first-rate EMS system ensures an ALS crew arrives on the scene within eight minutes of a call 90% of the time. And while that may be important for time-critical conditions such as cardiac arrest or trauma, clinical research is starting to demonstrate that rapid response and ALS may not be necessary for all incidents in systems that use emergency medical dispatch and have strong quality management processes. Takeaway: EMS needs to invest in things that matter, such as programs that help achieve the Institute for Healthcare Improvement’s Triple Aim. It’s vital to the progression of EMS that new system designs are developed to simultaneously pursue improving patient care, improving the health of populations and reducing the per capita cost of healthcare. Future system procurement and contract processes will focus on these important outcomes. Takeaway: In addition to patient safety and staff fitness initiatives, EMS must focus on fatigue. Requirements for meal and rest periods, limiting employees from working two or three full-time positions, and providing non-punitive self-timeout opportunities if caregivers feel they’re unable to perform are critical. You have to be proactive, and you have to manage your risk. Attaining fiscal sustainability needs to extend further than the efforts behind community paramedicine and mobile integrated healthcare. 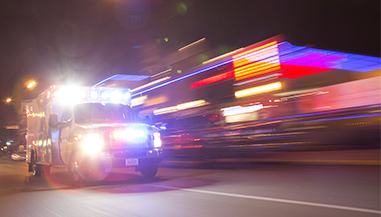 For many EMS agencies, expenses and revenues don’t correspond. In 2014, the Department of Justice collected $2.3 billion from healthcare fraud cases and more than 700 new false claims were filed. [iii] What’s different now is the administrative authority of the Office of Inspector General has significantly broadened. This regulation change is something EMS leaders need to be aware of – there’s more emphasis on fraud and abuse enforcement than ever. Takeaway: Sustainability efforts have to be transmitted throughout the organization. Leaders must prevent fraud and reduce turnover costs, while avoiding afflictions like “stupid overtime” and wasted unit hours. A key task for leaders is to create additional value for the communities and customers that use and fund our services and communicating that message at all levels in the organization. Performance measurement has become the common currency across all of healthcare, and if we want to get paid in the new healthcare era, we must demonstrate value. Yet an aversion to accountability continues to persist among EMS leadership. As leaders of EMS organizations, we don’t want to explain what we’re doing and why; we just don’t want to have to be held accountable. Takeaway: Involve caregivers in efforts to refocus on both quality patient care and other performance metrics. We’ve got to ensure that customer service is a priority and we need to measure what matters in order to manage. Leaders must communicate accountability throughout their organizations and to all stakeholders, internally and externally. In the future, if we are going to be paid for achieving outcomes, as agencies and as leaders, we need to be prepared for that reality. Although there’s conversation about diversity initiatives in EMS, there’s still a lack of actual progress being made. One of the toughest challenges for EMS leaders is to maintain a workforce that reflects the demographics of the community they serve. The most recent data show 75 percent of the EMS workforce is white, eight percent is African American, nearly five percent is Native American, and nearly five percent is Asian. The Hispanic population is significantly underrepresented even though the U.S. Census predicts 25 percent of our nation’s population will be Hispanic by 2050. Unethical misconduct within the industry, such as Medicare fraud, is making headlines now more than ever. Within the past several years, an EMS Administrator received six and a half years in prison after he was convicted of skimming nearly $500,000 from the agency by selling equipment, ambulances and even the EMS building and spending the money on cars, TVs and trips. [v] Ongoing investigations into forged CPR, EMT and fire certifications in several states are also damaging our reputation and credibility in the community. Sadly, once rare criminal events surrounding EMS leaders are becoming increasingly commonplace. But it’s not just about criminal activities; leaders have to make hard choices every day and these have to be made in a fair and impartial manner. High-quality, comprehensive mentoring programs are scarce at best, and the lack of succession planning will be problematic for the person stepping down as well as the next generation of leaders. We have to understand the prerequisites, self-attributes and the basic elements of leading others. We also have to be acutely aware of our social responsibility, clinical performance and task management. These are the pillars that are going to hold up the house of EMS leadership as we move forward. Without a process in place designed to identify talented individuals throughout the organization and prepare them for leadership roles, the industry runs the risk of not being able to maintain and grow the profession over the next decade as leaders begin to retire. Takeaway: I know it’s hard to let go. It takes both energy and hard cash to develop successors. But stair-stepped programs, like Beyond the Street seminars and the Ambulance Service Manager’s certification program, based on NEMSMA’s National EMS Officer Competencies, are a step in the right direction. You have to fully understand the professional development needs of the agency’s members, identify potential successors early and create a written plan. These are necessary steps to develop, train and mentor those employees with potential to serve as leaders. Patient abuse is a reality and EMS may be on a path of self-destruction that will lead to divisiveness, disdain and distrust in communities we serve if we don’t combat it. We’ve seen paramedics stripped of certification and convicted of patient abuse in recent years. EMS leaders have to educate caregivers to help prevent abuse and take decisive action if it occurs. The shooting and subsequent riots in Ferguson, Missouri, served as a turning point in police–minority relations. I’m going to be so bold as to make a prediction that if we don’t take action, there will be a Ferguson-style national incident involving patient abuse or racism and EMS. Takeaway: My question about poor attitude is: When did EMS service become “EMS serve us”? As leaders, we’ve got to deal with practitioners who have growing callouses on their hearts—we’ve got to make any abuse of any kind, physical or verbal, against the culture of our organization. Here’s a harsh message to all caregivers: If you’re callous, rude, hate-filled, racist or bigoted, or involved in EMS for any other reason than to be of service to human beings who call us, you will be discovered. And if you don’t have the heart of a servant, we don’t need you. I challenge EMS leaders to face this issue head-on, and if you don’t have the courage to do so then the profession doesn’t need your leadership either. As a profession, EMS struggles to understand stress; though we routinely see stories of caregivers coping with post-traumatic stress disorder, substance abuse and divorce, and despite a shocking rate of suicide among caregivers, leaders don’t pay enough attention to this epidemic. In 2015, an ASM project survey of more than 4,000 caregivers showed the severity of the issue when more than a third of respondents reported they had contemplated suicide while six percent indicated they had attempted suicide. We need to support rather than shame those in need. Finally, realize disruption is the new norm. Though these 10 issues must be addressed in order to move EMS forward, the first one leaders must dance with isn’t on the list. Our work isn’t changing. Change is our work. We’ve got to realize we’re often the elephant and that we have to be willing to dance the dance of changing our own behavior. The voice of change does not have to be disrespectful or rude, but it cannot be silent. 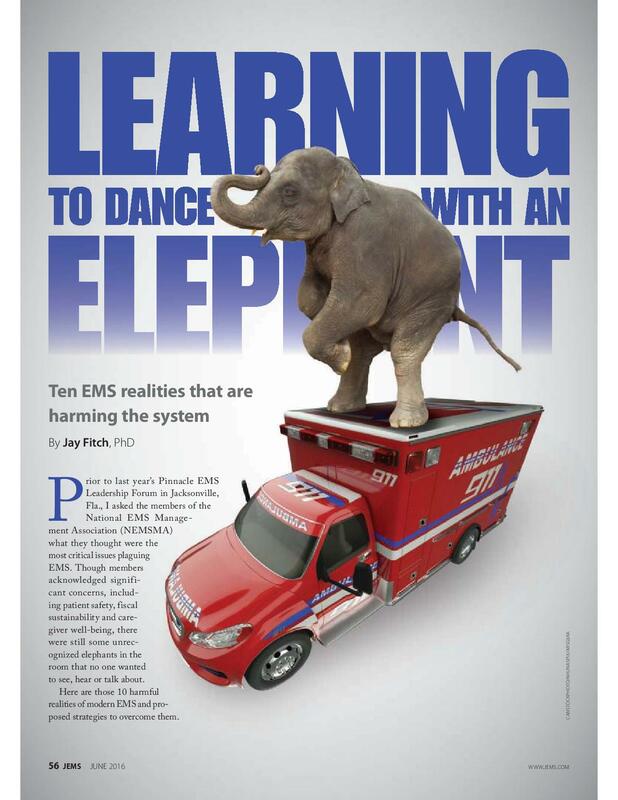 All of healthcare is beginning to learn new dances, and so, as we lead our EMS agencies, we have to change, too. [i] Reichard A, Marsh S, Moore P. Fatal and nonfatal injuries among emergency medical technicians & paramedics. Prehosp Emerg Care. 2011;15(4):511–517. [ii] Patterson P, Weaver M, Frank R, et al. Association between poor sleep, fatigue, and safety outcomes in Emergency Medical Services providers. Prehosp Emerg Care. 2012;16(1):86-97. [iii] Justice Department Recovers Nearly $6 Billion from False Claims Act Cases in Fiscal Year 2014. (2014.) Press Release. Retrieved March 30, 2016, from https://www.justice.gov/opa/pr/justice-department-recovers-nearly-6-billion-false-claims-act-cases-fiscal-year-2014. [iv] Powell, B. Diverse EMT Training Program Launches in Mpls. (2015.) Retrieved March 30, 2016, from http://kstp.com/article/stories/s3891849.shtml. [v] Lyttle, E. Ex-chief of private EMS gets 6 ½ years in prison for theft. (2014.) Retrieved March 30, 2016, from http://www.dispatch.com/content/stories/local/2014/11/17/Harrison-Township-EMS-theft-sentencings.html. [vi] Mental Health and Stress in Emergency Medical Services. (2016.) Report. Retrieved March 30, 2016, from https://www.nemsma.org/images/pdfs/Mental_Health_and_Stress_final.pdf.